I was talking to my son about the fact that 3 years of an average life is spent waiting as I mentioned in the last article. He said “What about sleep? That takes up a third of our life.” It is true that in an average life a person sleeps 24 years. Some experts say you need eight hours of sleep a night while others claim that six will get the job done. Either way we need that time to give our bodies a rest from the rigors of life. A time to relax, to escape into a dream world. There are many benefits to a good nights sleep the experts say. A rested body will perform better both mentally and physically. Unfortunately escapes from reality are not always dreams. People try to escape with booze, drugs and so many other things. Why do they want to escape? Well the answer may be that they don’t feel their life has meaning or purpose. They may be lonely or depressed. They may feel like their problems are overwhelming. Escaping from reality is a way to forget about the problems. The problem is it works for a little while. You start to forget about your problems after a drink or two. These other escapes be it drugs or what have you are not really escapes. They are just ways to not think about problems for a little while. After the drinking, drugs or other diversions are done you are still stuck with your same problems. The unfortunate part is that you have made your problems worse because you are not facing them. It did feel good to not think about the problem so you end up having your diversions more often. It’s easier and less painful living in the fantasy world and not facing reality. One of the funnier commercials I have seen is put on by Direct TV. It goes something like this. “When you can’t get your cable channels you get depressed. You go to a seminar to make you feel better. The seminar gives you all kinds of confidence in yourself. When you have all kinds of confidence you go to Vegas. When you go to Vegas you lose everything. When you have no money you have to sell your hair to a wig company. 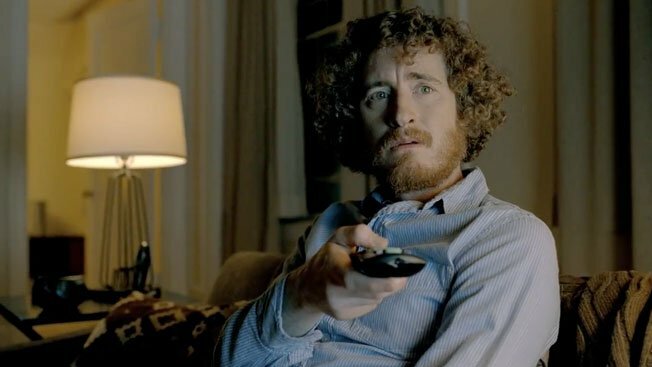 Don’t sell your hair to a wig company, get Direct TV so you can get all of your channels!” While this commercials example is somewhat ridiculous there is a bit of truth to it. One thing always leads to another. When you come to that fork in the road where you need to decide what world you want to live in consider this. Living in a fantasy world will never solve your problems. Like I mentioned before once the fantasy ends your problems are still there. What are you going to do? Go back again and again into the loneliness of escaping? There is another answer and it’s so simple. You can admit that you have a problem. You can look in the mirror and decide that you would like to change. 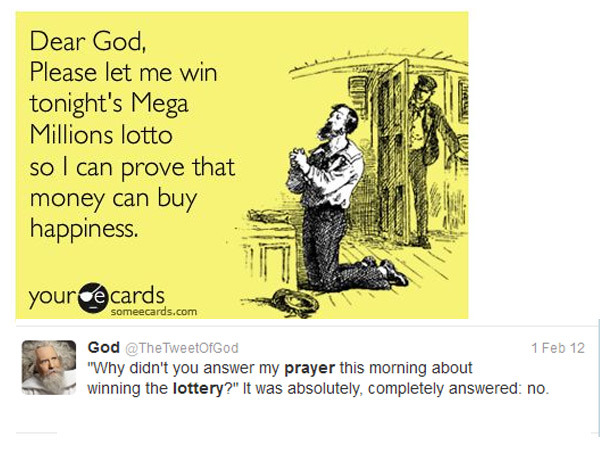 You can pray to God for help. The Bible says that God knows what you need even before you ask! He is waiting to help you with your problem. With Gods help we start dealing with problems in the real world! I’ve heard many stories of people in jail for crimes they committed. While in jail they come to the realization that they need Christ in their life. They pray the sinners prayer and Christ comes into their lives. Does that mean that they are no longer guilty for what they did? Well the fact is many still have long prison terms to serve. The difference however is the peace they start exhibiting in their lives. Even in their bleak circumstances they can have joy in their hearts! Your circumstances probably are not as bleak as the people in prison I mentioned. Yet even if they were the answer to your problems can be found when you humble yourself and give them to God. He knows how to handle them. The Bible says to cast all of your cares on him because he cares for you! This is not an escape from reality. This is embracing reality and turning your real situation over to the God of the Universe. Just as one thing follows another in a bad way it can also follow in a good way! As God gets bigger in your life your problems seem smaller! Now you see the same problems but your not trying to deal with them alone. You embrace the reality of God and his purpose for your life! What are you waiting for? Christmas? Well as a little kid that is exactly what I was waiting for! Picking up wrapped presents and trying to figure out what they were was always an exciting time. Never could seem to get that right. I remember the excitement and how hard it was to get to sleep the night before! We couldn’t wait for morning to come, but it was so hard to wait! Eventually we would fall asleep, but only long enough to get a required amount. On more than one occasion my sister and I were up at the break of dawn. My sister would leave coffee and doughnuts out for Santa. She was pleased when the next morning they were gone! Good ole Santa never passed up a doughnut I guess. He wasn’t concerned about slimming down! As we looked into the living room that was still dark we could see shadows of presents Santa had left! Mom and dad would have a few presents that they didn’t wrap. They would have them sitting out. Those were the gifts that Santa brought! Nothing could start though until mom and dad got up. Luckily for us they would get up early when they heard us stirring around! I saw someone the other day waiting around the microwave waiting for their coffee to warm up. The thought occurred to me that we spend a lot of time during a normal day just waiting. They say that if you live 70 years 3 years of it will be just waiting. Waiting for what? Graduation, an answer to your house offer or counter offer, weddings, a baby to be born, the diagnosis, an operation to get over, and someone to die are serious waits. Waits for the final bill on expensive services such as car repairs, medical bills, funeral expenses, lawyer fees, and many others. With all of the waiting that we do it is easy to get into the waiting frame of mind. Instead of making decisions it is so much easier to wait. Let’s not jump into anything. Sometimes it’s a good thing to wait when people try to pressure us into things. Other times a quick decision is needed. By hesitating we lose our opportunity. The great stock tip doesn’t last forever. The guy who doesn’t share his true feelings may find his future wife has found someone else. Sometimes we become like the deer in the headlights, we freeze. There are times in life when we know what we should do, but we wait. Jesus has his gift of salvation out there and he is waiting for you to accept it. What are you waiting for? Christmas? Don’t you realize that Christmas is already here? Which group worships God more? is what happens outside these doors. Leo Durocher, the famous baseball manager told a story in his book about Phil Wrigley, longtime owner of the Chicago Cubs. Mr. Wrigley would like to go into the upper deck and watch the games from there. In Leos first year as manager that was not a problem. Crowds were small and the seats were rarely taken. In his second year however, added interest in the Cubs was gained. Invariably the usher would come around and ask Mr. Wrigley for his ticket. Leo concludes that if it were him he would have lit up a cigar even though he didn’t care for cigars, just to blow out the smoke. Then he would say to the usher “it’s okay son, I own the place, keep up the good work.” Mr. Wrigley was never like that. He would get up and apologize to the usher and head to a less populated area. To their credit bosses on the reality show Undercover Bosses never give away their cover although I’m sure sometimes it is very tempting. The show is about owners, presidents, or CEO’s of companies disguising themselves and passing themselves off as new people in the company. The camera crew is explained in various ways from two people competing for one position to doing some kind of a special documentary of a new person on the job. They try to get natural reactions and hope that the presence of the camera does not interfere with what people truly think. Chad Hallock was raised by a single parent in Anaheim, California. He and his brothers knew that they needed to start at a young age helping with finances. Chad was working in a window covering business when he lost his job. He and his brother along with 3 other friends started Budget Blinds on $5,000 each. Today it is the largest window covering company in North America! They have over 800 Franchises all over the United States. Chad decided to be the focal point on an Undercover Boss episode so that he could get a better awareness of how their businesses are being ran with the hope of helping franchisees increase their profits! He went under cover as Tom Robbins with the story that a reality show called Second Chances would be filming him as part of a plan for a failed business person to get financial backing for a new company. Chads first visit was to a franchisee named Keith in Morris Illinois. Keith had been in the business for 10 years and described to Chad how he started. “Someone had come over to his house to install blinds and he really liked what they were doing and the new business prospects.” He added that “the next thing he knew he was flying out to corporate headquarters and meeting Chad and his brother.” He described the brother as more flexible, more laid back. He described Chad as a rigid guy who was defensive. Chad is heard denying the charges to the camera but explained that he does take the business seriously. It was comical watching Chad as Keith thought he was talking to a new person about someone else. Chad (Tom) met a franchisee named Maris in Chicago. Maris wondered what his experience was and Chad said that he was in the Iron Art business until the economy downturn hit. Maris took him on a installation appointment. Maris was very good in what she did but she found Tom (Chad) clumsy. He had a hard time drilling the holes and dropped the screw. She concluded that he was too quiet and she thought this was Toms first time working with a drill and screws. She didn’t think he was qualified to be a future Budget Blinds Franchise Owner. Chad was impressed with Maris! He called her a real go getter and liked her initiative of doing mailings to increase her business! Later Maris shared with Chad her view that local advertising would be helpful to her business. Keith had also made the same plea but Chad had dismissed it as someone not knowing what they were talking about. When Maris made the same statement it got Chad thinking that maybe they had a point. Typically on the show the boss learns of the personal lives of their company workers. In this case after the appointment Maris was telling Tom (Chad) that she had two sons. One of her sons, Tyler, who was 12, had a football injury. He had suffered two stingers in one season and was dealing with neurological damage. She was trying to get help for him but was finding it extremely difficult. Hearing the frustration in her voice, I could see that Chad was deeply effected. Chad (Tom) met Pam who worked in the factory where the blinds are made in Middleton Wisconsin. Pam thought that Tom was cute but later admitted that he was like a bull in a china cabinet working this job. They worked as a team putting together individual blinds so that they could be painted. Chads comments about the job to the camera was how monotonous it was. When he asked Pam how she liked her job she said “don’t ask”. Chad found out that there was no employee recognition. Pam brought up the fact that they used to have a company picnic but it was cancelled. Chad left with Dennis…later Dennis broke down and so did I! After their appointment Chad (Tom) and Dennis went to a local bar for a beer. Chad asked Dennis about his family. Dennis had 5 kids and one who they lost. When Chad questioned him Dennis said that his son was murdered and he found out by a phone call. They told him where it happened and Dennis found his son dead on the street. Once again you could tell that Chad was deeply moved. The show concludes with the franchise owners and employees invited to corporate headquarters. I think they were given the story that they needed to be there to give their opinion of Tom and his future potential in a new business. Individually as they are sitting there Chad (Tom) comes into the room. Now he looks completely different. Instead of the casual appearance they saw before he is in a nice suit. He speaks with each one before the next is called in. After realizing that the bumbling new employee was actually the CEO of the company there is a lot of apprehension as to what they said on the job. Chad talked to each one about the business end of what they were doing. To Keith he mentioned how he was the stiff, rigid, defensive guy. But when he got serious he talked about a local advertising fund that both he and Maris had recommended. After hearing the same complaint twice he reversed his opinion. He also mentioned how Keith needed to direct customers instead of being laid back and letting them decide things for themselves. He was going to send his brother to oversee his training since Keith liked his brother so well! Since the local advertising was a big issue with Maris, Chad mentioned to her that he was going to put $25,000 into a fund for that purpose. Pam was commended for her attention to quality control. She was very focused on putting out a good product! Chad told Dennis that of all of the people he worked with he enjoyed working with him the most. He was commended on his professionalism and the great job he was doing! Usually in experiences when people are giving they are the biggest beneficiaries. Chads comments proved this true again. His mission was originally to go out and help his company employees become better at what they do. He accomplished that mission with flying colors. He also found what his people thought about the company and how they could best be productive in the future. He was able to share the wealth of the company to meet personal needs within the company! I’m sure that he felt much more attached to the company and the franchisees after this experience! His final ending statement about the effect of this adventure on his thinking was this line:”I learned that the franchisees need to be heard. I have to be more patient, debate less and listen more.” In other words be more humble and more caring! Now that is a concept for us all to strive for! I’m thinking of a new reality show. Maybe we could call it Outside These Doors. It would be a show similar to Undercover Boss where a representative of the church goes to a business in which a church member is working. It wouldn’t be the pastor because they would be too recognizable. It might be a random person that reports back to the pastor. Maybe the random person would be searching for the meaning of life. We could have our camera crew just like the undercover boss show. It would be interesting to see how the church operates outside of the church. How many people would lead a stranger in the sinners prayer? How many members actually take their relationship with God outside of the church and into their everyday lives? What would the attitudes of the members be like at work? I know that some people would star because of their love for God and their compassion for others! Some may make us wonder where they are hiding their light. Would this new show end up on the Christian Channel or the Comedy Channel? Or would it be canceled by CBS because the reality is more than we would want to see? by things that I do? so I’ll get my way? when you look down from heaven. I’ve heard the question forever, “Is the glass half empty or half full?” It seems like a silly question because in reality it is both. Yet, the way you look at that glass determines if you are an encourager or a defeater. Years ago I heard an old story. A man had arrived at a new town. As he was getting off of the train he saw a train employee. “What is this town like?”, he asked. “What is your hometown like?”, was the reply. “Well in my town everyone is out for themselves. Nobody is willing to help anyone. There is not a friendly person there. Nobody smiles much, it is a dog eat dog town”. “Well that is exactly how this town is too”, said the train employee. A day or two later a different new person to the same town arrived. He asked the same train employee the same question. “What is this town like?” “What is your hometown like?”, was again his response. “Well my hometown is the friendliest town I know. People are always helping each other with a smile on their face. If I ever needed anything somebody would always be willing to share!”, replied the new arrival. “That is exactly how this town is too!”, said the train employee. What is this town like? As I walk in to the Rec Center I see them. Students all around on the exercise equipment. Conveniently many are watching TV as they exercise. Others are reading books. I always wonder how it is possible to read and comprehend anything as your body is moving on a bicycle machine? I have tried some different machines. My favorite was the rowing machine. I actually completed the time I set for myself a number of times. Each time it felt like drudgery. I’d set the thing for maybe 10 minutes. After about 2 minutes I’d be looking at the clock. Wow, I have to do another 8 minutes of this thing? It wasn’t so much how hard it was. It was more about my thinking. Too much time to think about the actual exercising that I hated to do. The TV might help for a minute. After that it was still 7 more minutes to go! We met while he was working on the third floor. He had heard that I had loaned out my book and he was interested in seeing it. That was my initial introduction to Kahler. I had been playing racquetball with a group that was better than me and in far better shape also. I asked Kahler if he played racquetball? I think his answer was he hadn’t played seriously in a long time. We made a time and started meeting at least once a week on the racquetball court! I could tell when we first played that Kahler had a lot of potential! He hit the ball very hard and could make great shots! One other thing that stood out was Kahler would actually dive after a ball if it was almost out of reach! That extra effort won him a number of points! One night I was hitting one of my tricky serves and Kahler was having a terrible time returning it. I could see what his problem was and after the game I mentioned it. This particular serve was going to his backhand at a quick pace and angling toward the corner. Kahler was trying to backhand the ball at that angle and he wasn’t able to get the good part of his racquet on it if he hit it at all. Finally I mentioned what he might try. It was a lesson I probably learned while getting schooled by those better players. Sometimes when you offer advice to people they turn you off. “Just play your game and I’ll play mine”, they might say. Not so with Kahler. He was open for new ideas to improve his game! “If you turn your body and follow the ball around the corner you can hit it off of the back wall with your forehand”, I offered. With that piece of advice Kahler very rarely got tricked on that serve again. Why did I offer that advice to my opponent? I can truly say that I wanted to see him get better. I knew that he would probably take that little piece of advice and use it to beat me. Yet, that was better than getting 4 or 5 points handed to me in a game without effort. As time went by Kahler has said things that have improved my game and encouraged me also! You’ve heard the saying hundred of times I’m sure. There are two types of people, givers and takers. The biggest giver that I have ever known is Gary. I met Gary when I was 12 years old. He was a member of the church I was attending. My regular Sunday School teacher was not there one day. Gary was filling in because that is what Gary was about, helping where needed! He asked if any of us would be interested in playing softball for the church team. Naturally I was very interested! That started a lifelong friendship with Gary! He used to be my ride to all of the games. Over the years I have seen that guy give away his money, time, and advice to anyone without ever asking for anything in return. He would consistently pay the softball leagues team entry fee out of his own funds so his team could get in. We are talking a few hundred dollars here. He never asked for anything in return. Many times he would read about some high school player or coach that did something good in some way. Gary would make the effort to go to a game and actually tried to meet the person and shake their hand. He is always thinking of others and is the most giving encouraging person I have ever known! Gary came over and helped me paint my house that I would be moving into a few days later after I got married. He never asked for anything. He did it as a gift to me. It was a gift long remembered after the other gifts were forgotten. Yet, for everything Gary has given away I have never seen him needy. He has friends from all over. It is still very hard to pay for anything with Gary around. He is such a giving person it is almost hurtful for him not to be giving all of the time! 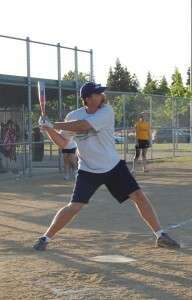 I have played slow pitch softball for years and years. There are always players who think entirely of themselves. Forgetting all about that it is a team game these players draw all of the attention to their individual failures. I remember one particular player and believe me there are hundreds like him. If he had a good hit all was well! He was up and everyone followed his lead. But when he didn’t hit the ball the way he felt he should look out. First of all he would not even run the ball out. If he hit it in the air he would walk back to the dugout with his bat. A few times the other team actually dropped the ball but this guy was almost back to to the dugout with his head down and was an easy out. Shuffling around with his head down was his calling card. If there was a bat around he would kick it. He would also be known to throw a bat or two. The other players would try to encourage him, but he would have none of it. It would take an inning or two to get his head back in the game. If he had a bad at bat the next time it was the same story. After awhile it was hard for the other members of the team to keep trying to lift this guys spirits up. The wasted energy that his act had on the team was devastating. The best thing to do was to let him stew alone on the bench while encouraging the rest of the team. I’ve seen other players who realize that not being successful all of the time is just part of the game. They didn’t stop hustling though! On the worst hits you could imagine they took off like they were shot out of a cannon. When they were called out they trotted back to the dugout with their heads high. Instead of taking the game so seriously you could actually hear them laughing about their futility. “I sure hit that one a mile”, they would say after topping the ball to the pitcher. Then they would start yelling encouragement for the next batter! That is the type of teammate that I always liked to play with! When Kahler and I are playing racquetball we forget about the time. All we are concerned with is how to beat the other guy. Since we are both very similar in skills the games are always very competitive. We always play two games. When either one of us loses the first game we know that we can redeem ourselves the next. Most of the time we split the games. Sometimes one or the other wins both. Either way after every game we shake hands knowing that we both did our best! We know that we gave each other something far more important than who happened to win the games that day. We feel more energized and healthy after the games are over! There’s not the drudgery of exercising on a machine. We get our exercise in a fun way! After the time has flown by and we are leaving the court in our sweat drenched shirts we talk about the games. Kahler is always quick to recognize some of the shots that were successful for me! I commend him on his good games and plays he had! Sometimes when one or both of us are not up to standard we laugh about it. Instead of making excuses though, it usually goes something like this: “I may not have made some shots but the way you were playing probably was effecting that!” If both of us play especially bad there is laughter as we admit our failures. If one of us happens to lose both games one week there is a little extra motivation! We start thinking about things we might try differently for the next weeks games. We have both seen the level of our individual games dramatically increase and we both have each other to thank! 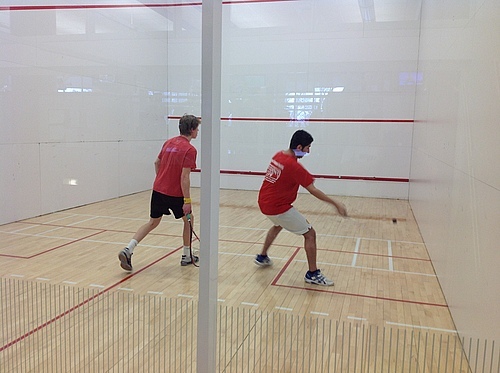 By encouraging each other we have reaped the benefits of health, friendship, and racquetball skills! When God looks down from heaven which person does he see in you? As Christians we should be the most positive, generous, friendly, and encouraging people on earth. However, within the church we see teammates that always need encouragement. We see teammates with a constant smirk on their faces. We see teammates that are always complaining. Instead of listening to sound advice they have decided that they like the constant attention to their problems. Living the Christian life has become a boring exercise in ritual that is a drudgery they must endure each day! Does any of these descriptions describe you? With everything that God has given us how can we not be givers back? How can we just think of ourselves when there is a world out there that needs our help? How can we refuse to shine our light in a world of darkness? There was an old baseball umpire who was trying to decide if the runner was out or safe on a close play at the plate. The catcher looked back at the umpire who was slow to signal. “Well what was he?”, the catcher quipped. The umpire stood straight up and looked the catcher in the eye. “He ain’t nothing til I call it and when I call it that’s what he is”, he barked. That is how it is with us too. We decide how we want to look at the world! We decide how we care to look at our problems! What is your hometown like? Be careful how you answer because your answer describes how this town is too. When you are looking at the glass that is filled half way add some love, compassion, forgiveness, encouragement, generosity and unselfishness water to the glass. Then you will clearly see it is much more full than empty! It used to be that the Easter holiday was talked about openly. We used the word Easter just as we used the word Christmas. “Have a nice Easter”, we offered. In the politically correct world that we live in now, someone might take offense to us wishing them a nice Easter. Someone may not like being told to have a nice Christmas. Now we have to say have a nice holiday or just have a nice weekend. Speaking of Santa Claus or the Easter Bunny seems to be okay as long as we don’t bring Jesus Christ into the equation. The rules have changed but are we better off? The score was 19-14 in favor of the Chicago Bears on this September 12, 2010 game with the Detroit Lions. Shaun Hill, the Lions backup quarterback was leading his team down the field. With 31 seconds left and the ball on the Bears 25, Hill went back to throw. A looping pass was thrown into the end zone of which Calvin Johnson, the Lions wide receiver, out-jumped Zack Bowman of the Bears for an apparent touchdown! Johnson caught the ball came down rolled on the ground holding the ball in the air and appeared to be ready to spike the ball. At that moment the ball came out of his hands. Touchdown ruled one of the officials. The other official ruled incomplete pass. There was a controversy and the replay was reviewed. The announcer and the commentator were both sure that the decision would be overruled and the Lions would be ahead in mere moments. The decision came back, incomplete pass; and after 2 more plays the game was over. Apparently the controversy came about because of a new rule. Players used to be able to dive after balls and catch them in the air over the goal line for touchdowns. Many times the player would hit the ground and the ball was dislodged. Touchdown was the ruling because the ball was over the goal line and the player had possession. The new rule stated that the player had to complete the process and control the ball all the way through the play. Because of this new rule which was made because of these diving plays, Johnson’s touchdown was disallowed. Recently we had our taxes prepared. As always there was an accounting of everything we did financially for the 2011 year. It is an interesting process. Sometimes things need to be accounted for that we had forgotten about. Other times we remember some item and hope that it doesn’t have a major effect. We do our best to have all of the information with us, so that the accounting goes easier. Our information was almost the same for 2010 as it was for 2011. However, we found out that there was a tax rules change which resulted in a big difference in a negative way to our bottom line. I want to skip forward to another proposed rule change. It was suggested years ago in a song by former Beatle John Lennon. 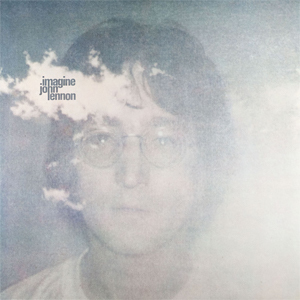 In his song Imagine, he suggested that we “imagine there’s no heaven.” He goes on…”It’s easy if you try, no hell below us, above us only sky…Imagine all the people, living for today.” The chorus to the song goes, “You may think that I’m a dreamer, but I’m not the only one. I hope someday you’ll join us, and the world will be as one.” I would like to take a little bit of time to analyze the words he chose. “Imagine there’s no heaven” Okay if we have no heaven we have no God. Because the Bible tells us that God lives in Heaven. There is no Jesus because he is sitting on the right hand of God in heaven. There are no angels since they also reside in heaven. There is no eternal life since that was promised in a place called heaven. There is no salvation because if Jesus never existed he didn’t die for our sins. After we die it’s all over which is exactly what he suggested as we can see by the words “imagine all the people living for today”. There is no right or wrong because we have eliminated evil and good. We might as well eat drink and be merry for tomorrow we will die. Would you really want to live in a world where people were just living for today without any consequences for tomorrow? I remember first hearing about the concept in a 9th grade biology class. The theory of evolution was being taught in the schools at that time even though some of us were opposed to it. I wrote an article in the schools newspaper against what was being taught. Obviously it didn’t help because the theory has continued in our schools. 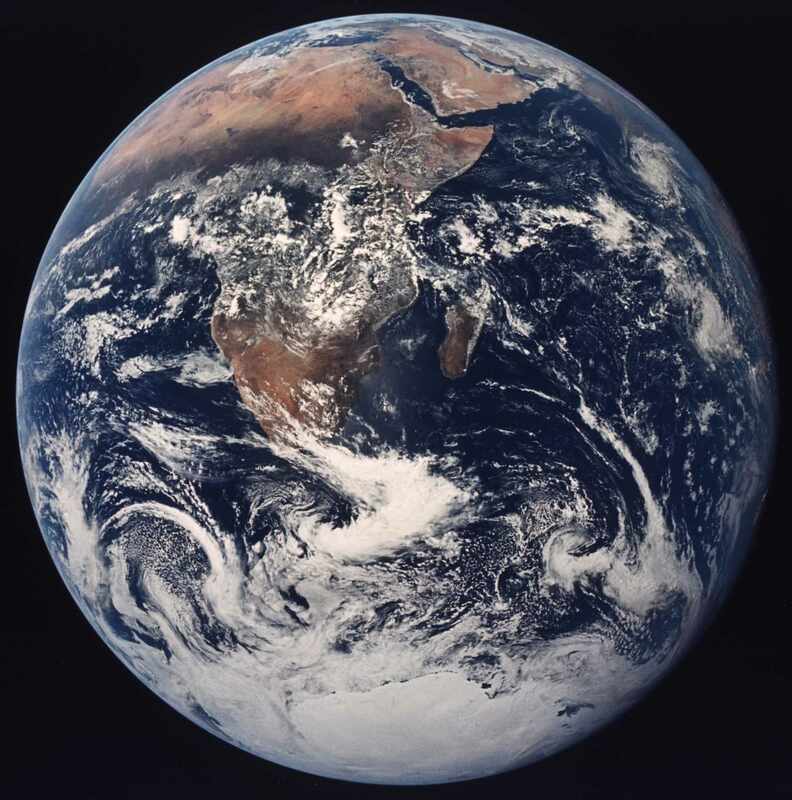 When asked for equal time for the creation theory the teacher just said, “well the creation theory is that God created everything.” Then he would start again on the evolution way of thinking. Sometimes so called truth was thrown into the equation. Well the earth is millions or billions of years old. Oh really? Who said? I googled how long man has been on earth and someone said scientists believed 90 million years. According to the Bible man has only been here around 6,000 years. Since living to 100 years is a long long time for any of us nobody can rightfully answer my question. I’m going to present a case for creationism and I’ll ask you to imagine also. Imagine that you went into the woods and you noticed a beautiful painting. You don’t see any brushes or art tools around. What you can’t get your eyes off of, however, is how beautiful this painting is! It is a detailed picture of a sunset, or a brook, or the mountains — whatever you can imagine. You analyze the situation. You could conclude that somehow someway all of these colors and beautiful expressions of talent had miraculously just came about. Somehow maybe there was some paint around and the wind blew and amazingly it found it’s way on the canvas. That would take a lot more faith than anyone could truly have. Since only a fool would believe such a wild conclusion, you dismiss this thought in a second. How did this beautiful work get here? You can only come to one clear solution — Someone has taken a lot of time and carefully painted this picture. The stores know what they are doing. As I walk in I’m trained to look for a cart. Yes, the shopping cart which will make my experience so much easier. We are sold on the convenience. It is so much easier to use a cart than carry the groceries ourselves. The reasoning makes perfect sense for the customer right? It also makes perfect sense for the marketing of products. It has been proven over and over how much more people buy because they have a cart. You may go in with just a few things on your list, but if they can get you to push a cart extra things end up in it! For our convenience they make the cart nice and big too. They wouldn’t want us running out of room in our cart. They think of us by putting a rack down by the wheels. So convenient when we need an extra place for the pop or the beer. The cart also has a kids seat. How handy is that when you have a kid along? You hear it all of the time in the store. It’s the voices of kids who may be riding in that little seat. The stores know what they are doing. By having that seat in the cart they have made a convenient way to add another customer. Although this customer usually doesn’t have any money, they are a big influence on extra things that get into that cart! I’m walking through the store and I hear a familiar voice. It’s the voice of a kid and the words are pretty much the same. “Mom, mom”…sometimes the mom ignores them knowing from past experience what is going on. Other times the parent is patient..”no honey, we don’t want that today”. Other times there is a little anger “put that back now”! It is usually the same story. The kid has grabbed something going by or they are trying to reach it. If they can’t reach the item they start in with the “Mommy”. Sometimes the parents give in which is the marketers delight! Often there is a reaction to the no answer. That is when the tears start coming and the loud crying that echos throughout the store. Sometimes the parents discipline their children right in the store which leads to really loud crying. One of the favorite things that kids want is candy! They must remember that great sweet taste from the past and hey, there it is again! Suddenly it is in the cart until it is discovered. Sometimes it may be a toy or any other object that catches their eye. Smart parents know when to say no. We have been around long enough to know what is good for them! We could go in the opposite direction. “Sure honey, take all of the candy you want”! “Let me help you put it in the cart”. When they get older we can say “stay out as late as you want, it’s okay with me”! “Sure, you can do drugs, no problem”, “make sure you have a gun with you”. “I won’t be around for hours when you get home, so do whatever you want”. “Whatever you want you can have”. You tell me, which parent loves their kids more? Is it the one that gives them all that they want and doesn’t care what they do? I’m sure that if you are a responsible loving parent you can see my points. You may even wonder why I am bringing up such obvious things. Yet, there are so many of us that beg God for things and wonder why he doesn’t give them to us. James 4:3 says “When you ask, you do not receive because you ask with the wrong motives, that you may spend what you get on your own pleasures. Kind of sounds like that kid in the grocery store doesn’t it? Is there someone in your life who comes around only when they need something? Hello, Joe How are you? It has been a long time! What’s new? “I was hoping you could help me out”, Joe begins. Oh no, what now?, you think. As Joe continues about the mess he is in and invariably asks you for money or some other favor it gets annoying. You start thinking, this guy only wants to use me and doesn’t care about me at all, except when he needs something. My former pastor had a beautiful story that illustrated how God thinks. He had a daughter and she would call him. “Daddy”, she would say, “I just called to tell you how much I love you”. “I want you to know that I am so blessed to have you and mom for parents. I am so thankful that you have always looked out for what was best for me! I am so blessed”. When he got off of the phone, he would invariably ask his wife, “Is there anything that she needs?” I can assure you that your heavenly father feels the same way. When you come to him and tell him how much you love him and mean it there is not a good thing he wouldn’t give you. He looks at the heart and the motives. He knows when you are sincere. So my question to you today is Who is God to you? Is he that father in the sky who you expect to give you whatever you want? Or is he the loving father who says no sometimes because he knows what is good for you? Are you someone who only comes around when you need something? Or do you make it a point to enter his presence just to say I love you?